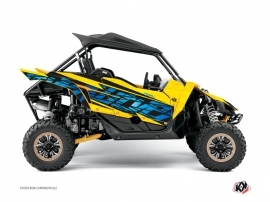 Kutvek Kit Graphik is an expert of high-quality UTV graphics. Our 13-year experience in this field allows us to propose ready-made designs as well as custom graphics kits aiming to satisfy the most particular and extravagant client requirements. Our innovative manufacturing methods of UTV stickers ensure bright and vivid colours and let them keep their radiance through the time. Our graphic creations are inspired by the last tendencies of extreme sport and we do not stop to renew them. 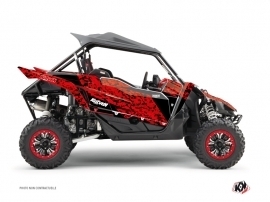 We work together with the main brands of UTV (Polaris, Yamaha, Can Am, CF Moto) in order to offer you the stickers that suit extremely well the templates of the most recent models on the market. • It was never so easy to customize your Side by Side! With Kutvek top-quality stickers under applied heat the patented material of the kit hugs perfectly any form. However, our special glue gives you the chance to modify a position of stickers within some minutes. • You will love the sparkle and the intensity of your decals even after many years of use! • Our graphics kit is exceptionally resistant to frictions, UV rays, water contact and other negative impacts your tireless mud runner may meet in the off-road conditions. 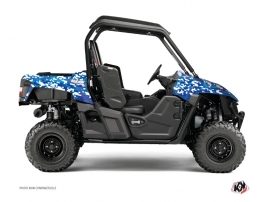 • No more worries for the state of your UTV’s bodywork: it is kept unspoiled from the constraints of use thanks to the solidity of our custom vinyl stickers. Let your individuality come out by choosing our personnalised stickers. You can add your favorite logo or change the colour of existing model in the semi-custom version. But you may also yield to the graphic creation 100% your style! Kutvek Kit Graphik is at the leading edge of technology for decorating the most popular Side by Side UTV models like Polaris RZR, Polaris Ranger, Can Am Maverick, Yamaha Rhino, Yamaha Wolverine, Can Am Commander, Yamaha Viking, CF Moto Z Force. 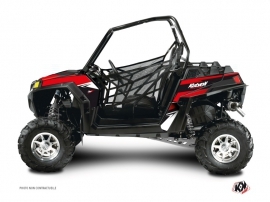 Have you equipped your Polaris UTV with an extra component - a door? 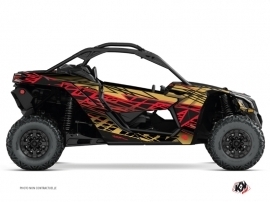 We are happy to suggest you vinyl stickers for this element perfectly suitable with your entire Polaris UTV graphics kit. 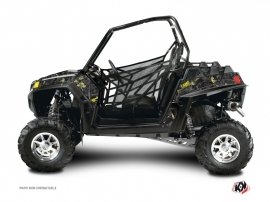 We have also ready-made designs for the doors of Can Am UTV. We invite you to visit our page Accessories to learn more about graphic patterns proposed for the doors of side by side vehicles. We are proud to embellish the UTVs of the following Riders and Teams: Jérémie Warnia, Team Polaris Xtrême Plus, Team Can Am BBR.